On December 8, 2015, Pope Francis opened the enormous bronze Holy Door in Saint Peter’s Basilica to launch the Year of Mercy. Normally cemented shut, the doorway symbolizes entrance into God’s presence where the faithful seek to obtain God’s mercy. In medieval theology, like today, the sacrament of penance required repentant sinners to make satisfaction for their transgressions through spiritual and corporeal works of mercy. This involved saying prayers, serving the poor, giving alms, or going on a pilgrimage. In the year 1095, Pope Urban II decreed that penitents would be released from their obligation to perform these works if they joined the crusade against the Turks. Subsequent popes repeated this provision by offering indulgences on other occasions. In gratitude, the faithful offered financial gifts to the Church. The custom of transacting indulgences escalated and eventually grew into a significant revenue stream. An inflexion point occurred in 1476 when Pope Sixtus IV issued Salvator Noster, a bull extending penitential satisfaction to deceased individuals for whom an indulgence was offered. So, for example, when Martin Luther visited Rome in 1510–11 and climbed Pilate’s stairway on his knees—the scala sancta, praying on each step—he did so on behalf of his grandfather. Such devotion was commonplace. The indulgence trade came to a head after Pope Julius II issued a “Jubilee Indulgence” in 1507 to support the construction of the new St. Peter’s Basilica in Rome. Urgency to fund the building project set in motion indulgence preachers who traveled through Europe obtaining money from families who might otherwise have used their coins to purchase shoes for their children. The Protestant Reformation followed, and the rest, as they say, is history. Catholic reform eventually abolished the sale of indulgences, but the custom of granting them continues to the present, as illustrated by Pope Francis’s Extraordinary Jubilee Year of Mercy, which is set to conclude on November 20, 2016. While there have been numerous developments in canon law concerning indulgences, the underlying logic remains the same. How does one go about obtaining an indulgence today? In order to extend this mercy to as many of the Catholic faithful as possible during the Year of Jubilee, the Church has opened a Holy Door of Mercy in every Catholic cathedral and at major pilgrimage sites throughout the world. Importantly, the indulgence obtained by passing through a Holy Door is a plenary indulgence—the full remission of all temporal punishment due to sin. (1) pray (the Creed, the Our Father, the Hail Mary, the Gloria . . .) and for the [prayer] intentions of the Holy Father; (2) within fifteen days, approach the sacrament of Penance, confessing one’s sins, and participate in the Mass, taking Holy Communion; (3) have the inner attitude of actual and affective separation from every sin, not only grave and mortal, but also slight and venial; (4) engage in a work of mercy, whether corporeal or spiritual. Once a faithful Catholic has met these prerequisites, being in state of grace, she can approach and walk through a Holy Door. She thereby obtains a plenary Jubilee indulgence for herself or for the sake of the souls of her deceased relatives or friends in purgatory. This indulgence may be secured once a day, and it lasts for the entire day. Prayer. Penance. The Eucharist. Separation from sin. Good works. If this way of finding the mercy of God sounds complex, there is another, more excellent way. Night and day I pondered until I saw the connection between the justice of God and the statement that “the just shall live by his faith.” Then I grasped that the justice of God is that righteousness by which through grace and sheer mercy God justifies us through faith. Thereupon I felt myself to be reborn and to have gone through open doors into paradise. The whole of Scripture took on a new meaning, and whereas before the “justice of God” had filled me with hate, now it became to me inexpressibly sweet in greater love. This passage of Paul became to me a gate to heaven. Nearly 500 years after Luther’s Theses, his insight into divine mercy continues to animate evangelical faith. The divine doorway is narrow, but it remains open to all—and is always open—for those who are in Christ. 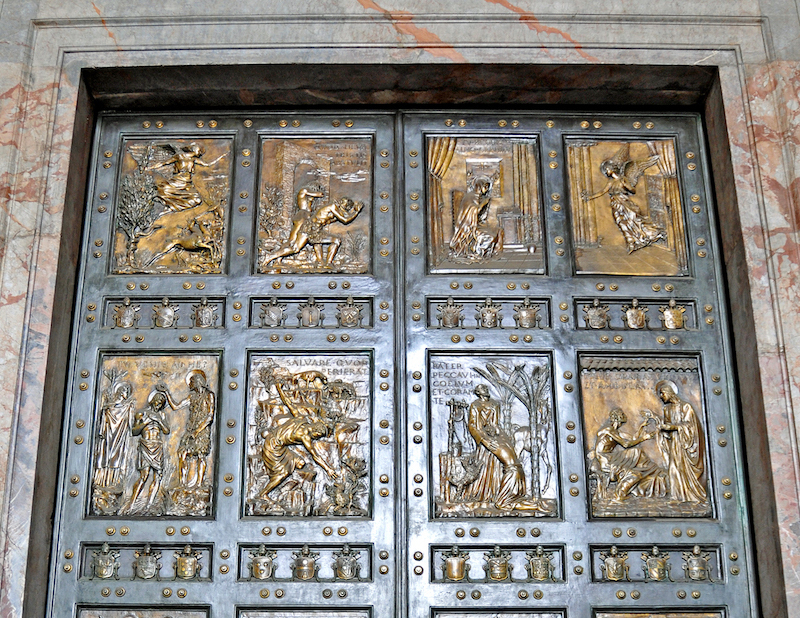 Even after November 20, when the Vatican has once again cemented the bronze doors of Saint Peter’s Basilica, Christians are invited to approach the Father without hesitation or impediment, on account of Christ’s perfect righteousness in which we are clothed. Gregg R. Allison is professor of Christian theology at The Southern Baptist Theological Seminary. He is secretary of the Evangelical Theological Society, an elder of Sojourn Community Church, and a theological strategist for the Sojourn Network. He is the author of two major works, Historical Theology: An Introduction to Christian Doctrine (Zondervan, 2011), Sojourners and Strangers: The Doctrine of the Church (Crossway, 2012), and Roman Catholic Theology and Practice: An Evangelical Assessment (Crossway, 2014).